January February March April (how can raining Johnny Depp heads NOT be my favorite??) May June July August September October November December Thanks for stopping by, and indulging me! And coming soon - a post dedicated to my own One Little Word for this year - "confidence". 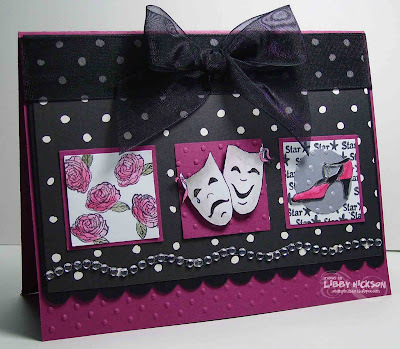 :-) Happy Stampin'! Ohhh I'm so glad you did this - I hadn't seen all these. I'm LMAO over it raining Johnny Depp heads!! The Alice is gorgeous as they all are. Honey, you should never hesitate to display your beautiful work. I am so proud of you, these are gorgeous!! AND I agree with Lydia about the Johnny Depp heads, too funny!!! Those are the prettiest cards!! Of course I love the Depp heads but I also love the theatrical one - aw heck, they're all great! It was so nice to see these all again! As always, I love your cards! LOVE it! I think my favourites just might be February (love those colours together!) and June (I NEED that sentiment!) & November (I still have not tried the famous Libby SnowGlobe!). They're all great! PUHLEEZ post more often! Love love LOVE these!!! What a fun display of cards throughout the year- I had not seen all of these- but LOVE them all. You have such a great artistic style! Libby, these are all fabulous. I don't know how I missed the Johnny Depp heads card last year. I love it! Thanks for sharing! 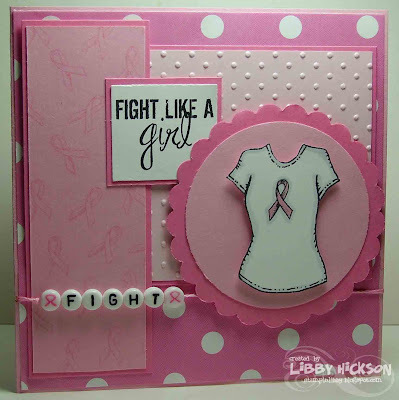 Great cards, Libby! And I like your idea of doing one representing each month last year - must remember that for next year! Nice trip down memory lane Libby! These are all wonderful creations...it really shows off your clean "style". Great display of the year, love the May, June, December those are my favorites! What an awesome array of cards! The "Raining Johnny Depp Heads" is hilarious! My favorites would have to be July (my birthday month plus I collect snowmen), November(snowman again plus I love the snow globe cards; I MUST try them some day!) 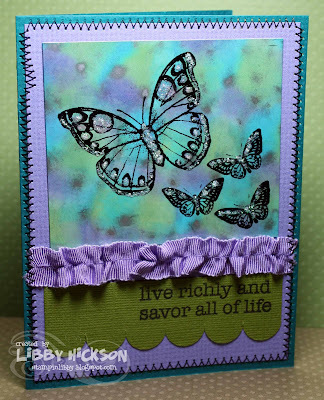 and December (love purple and teal and the butterflies look so real). I'm so glad I stopped by on the hop! 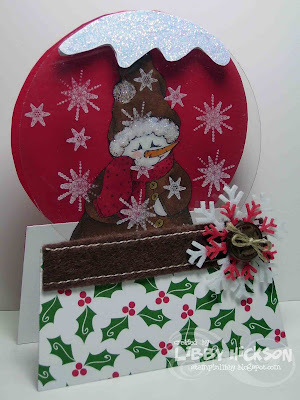 I love your cards! They are beautiful and fun! I love the variety! 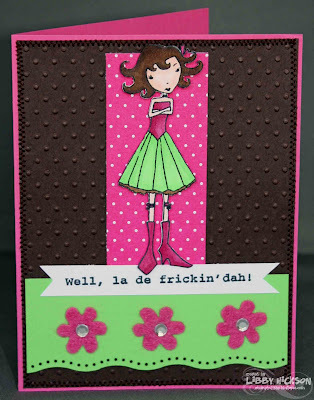 Ohhh, you have had one FANTASTIC card year! They are amazing and unique all of them. LOVE the Johnny Depp one, and the rest too of course! Happy 2010! I think it's unanimous - we all love Johnny Depp raining heads. They're all great - so glad you did this - inspired me for sure. 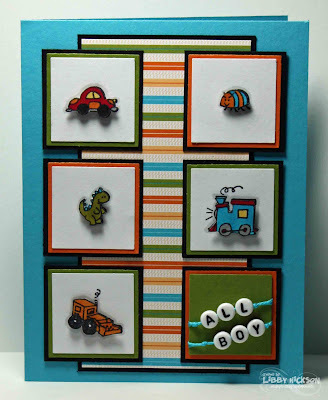 You all boy card is my next fave after The Johnny Depp heads! AWESOME selections! These are all great Libby!! I put a few of my own fav's on a few days ago...only because I was desparate in needing a post...LOL...thanks for sharing, these mostly were all new to me...gee where have i been?? Hey Libby! Thanks so much for re-capping and sharing the best of's with us! These are FABULOUS chick! They look great...I esp. like the ones with little stamps! Oh these are all FABULOUS!! LOVE, LOVE, these!!! And yes, the one with Johnny Depp just cracks me up!!!!! I LOVE him too!!!! What a gorgeous year in cards, Libby!! You ROCK, girl!! First off I just want to say how freakin' awesome you are!! 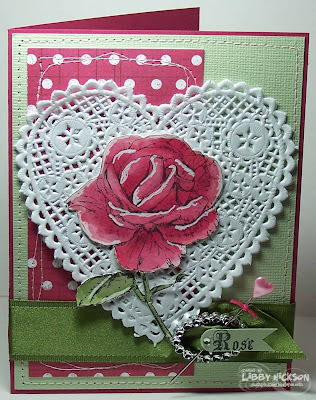 You have made some gorgeous cards in the past year. Thank you so much, Libby! Oh and for the awesome stamps as well. Oh wow, I love looking at all of your accomplishments during the past year! Such wonderful cards, isn't amazing to look back and see how far we've come...precious! My fav is the first one with the huge heart! 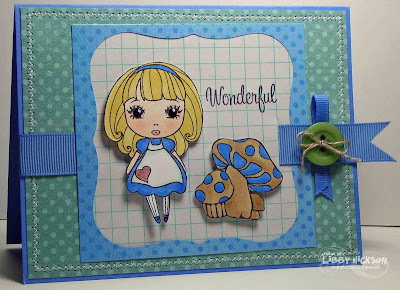 Wonderful design1 Looking forward to catching up with your blog in 2010..whohoo! Hi, Libby! I love this idea of selecting a favorite for each month. Makes me wish I'd thought to do that. It's really fun to see all of yours, and I absolutely can see why they're your favorites. I remember many of these cards and they were my favorites as well! Like most everyone else, love the Johnny Depp heads -- "and then I woke up" -- tee hee! 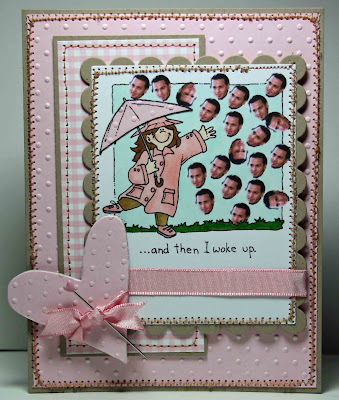 The baby card you did with Melanie's little stamps is one of my all-time favorites. Gosh, it was great to see these! Happy new year! 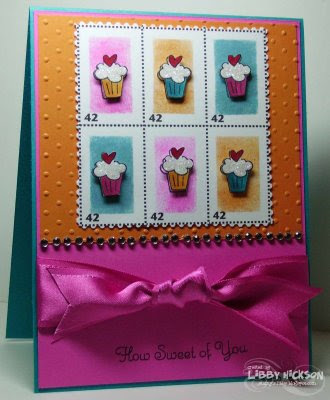 All fabbo cards girl, but my fave ( a bright one of course) is the cupcakes :) Johhny depp is quite a hoot! awesome Libby. I think my fave has to be the cupcake or butterflies, but I do love that snowglobe. I love the tutorial on SCS too!!! What a terrific look "back"! I had never thought of taking a walk back through the past year's creations ... but I'm glad that you did! How in the world did I miss this post?? 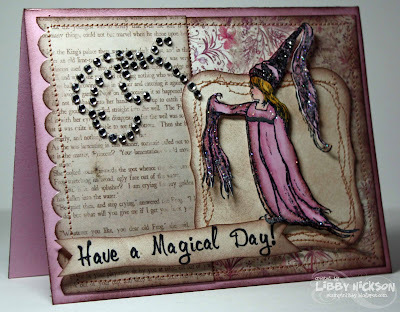 Libby this is such a wonderful idea and it gave me a chance to see more of your work! You are so talented!! Thanks for posting these beauties!